Head of the Libyan Presidency Council (PC) and the Government of National Accord (GNA) Saturday laid out plans to save the country from the current chaos and standoff, calling for general elections for next year. Faeiz Serraj indicated in a televised speech that it was important for the country to hold parliamentary and presidential elections next year in March to elect new central decision makers to coordinate the country’s affairs. Serraj was appointed in December 2015 under the Libyan Political Accord (LPA) signed in Morocco. Since arriving in capital Tripoli in March the following year, the Libyan official and his team have been unable to expand their authority over the whole country as they face rivalries inside Tripoli itself and across Libya. The PC and the GNA have also been wrestling with the Beida-based rival administration supported by the United Arab Emirates, and several other countries. The idea of the elections first emerged at recent meetings in Egypt between feuding parties. 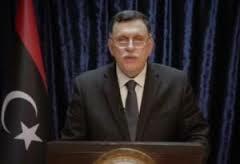 Serraj in his speech also indicated that the future role of the country’s president should be decided by the Tobruk-based parliament; the House of Representatives (HoR), and the State Council. He urged both institutions to set up a committee, which will agree on an amendment to the Constitutional Declaration that would determine the powers of the head of state, reports say. Criticized for being weak, Serraj distanced himself from the current political crisis but noted that the PC and the GNA have to address the situation. Libya descended into chaos since the removal of strongman Muammar Gaddafi in 2011 in a NATO-backed revolution. Rivalries between competing armed factions have thrown the country into a pit – giving rise to terrorist groups including the Islamic State group (IS). Even though IS has been defeated, the country remains very fragile. Analysts believe the group can bourgeon somewhere else in the country.